We had grand-pap's birthday party this week, he turned 95! Amazing isn't it? I mean...I can't even imagine being 80 or 90 let alone 95! I honestly think he's the only person I know that can still make me feel young LOL. I was in charge of the favors for his birthday party. The only directions mom gave me was that she needed 30 of them. I scoured the internet for ideas, but kept going back to the candy favors we had used at our wedding. At the time, I had bought labels online for Hershey's nuggets and stickers for the bottoms of kisses. The labels were personalized and we had used the candy sort of like table scatter. Not exactly what I wanted to do this time though. But I looked at every party store in Pittsburgh before I finally admitted that I wasn't going to find what I wanted, I was going to have to make it. I made a run to walmart to pick up a few bags of Hershey's miniatures, some ribbon and pretzel rod bags from the candy making section. I had plenty of pretty printer paper (I pick some up every time I see it at the dollar store) tape and construction paper at home so I didn't need to buy those. I measured the wrappers that were already on the candy and got busy cutting lots of paper strips to wrap around them. I simply taped each piece on the back. I lined 5 of them up and measured for a 'tray' which I cut out of black construction paper. I folded the sides up using my ruler as a guide. To assemble them, I slid the paper tray in the bag first then added the candy. I tied it with a silver ribbon and made tags on the printer using matching business cards I happened to have from the dollar store. (though it could have been done with the printer paper and a piece of construction paper as a background) I cut them out with scrapbooking scissors, punched a hole in the tag and tied a bow. I am by far not the craftiest person in the county, but even I managed this one with them actually looking kinda cute! I ended up making 34 and the final cost was around $.50 each. 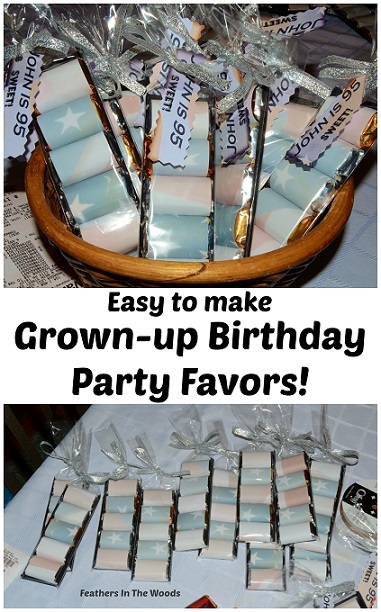 I thought that was pretty cheap compared to any of the premade party favors I saw online. Even if I had to buy the papers it still wouldn't have been very much more. It took me a few hours, but again...not the craftiest person. lol Someone with more skill could have done it much faster. Everyone thought the Stars & Stripes theme was great since Pap is such a proud veteran. All in all I really liked the way they turned out, and they were a big hit at the party! Thanks! They were a huge hit with everyone, especially his veteran friends!